A POPULAR star of Spanish bull runs named ‘Mouse’, or ‘Raton’ in Spanish, has died at the age of 12 in a ranch in the Spanish town of Sueca. 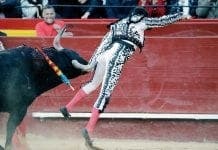 Raton, who mauled three people during his bull fighting career, attracted fees of up to €18,000 to appear at town festivals and fights. The black and white bulled reportedly weighed 550kg when he died earlier this month. Owner Gregorio de Jesus told the newspaper he planned to stuff the beast and put him on display at the ranch. Some 3,000 people turned out for his final run before he retired in September 2011. A much better idea – stuff Gregorio. Now he DID have a good life! Gored 30 people and killed three. Yeh, great life being tormented with idiots running around and baiting it. Attaching those flaming torches to its horns must have also been so pleasant for it. Duh. Relatively speaking… Can someone stuff Fred too?! 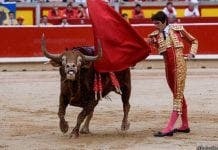 Please stop printing half-arsed articles like this about bull “fighting”, encierros, correbous etc. At least tell the truth about these brutal spectacles. 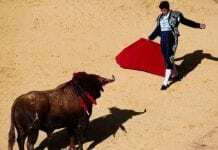 This article gives the impression that these bulls die peacefully after a happy life of chasing around, rather than spend their (often short) lives being tortured for fun, oh sorry “la fiesta nacional”. Jenny, Raton had a good life. Mr P said so.